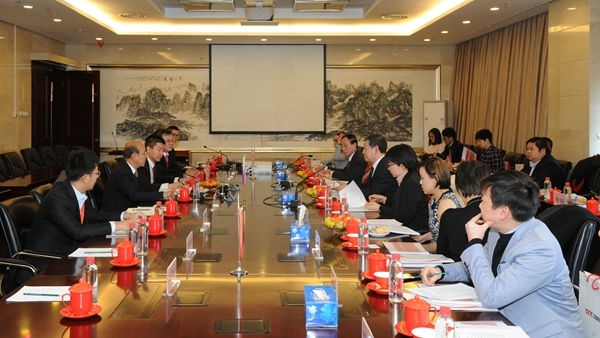 On 22 January 2019, the ASEAN-China Centre (ACC) organized senior officials in charge of economy, commerce and science & technology from embassies of ASEAN Member States in Beijing including Indonesia, Malaysia, the Philippines, Singapore, Thailand and Viet Nam to visit China Electronics Technology Corporation (CETC) International Co. Ltd., and exchanged views with senior management of the company. 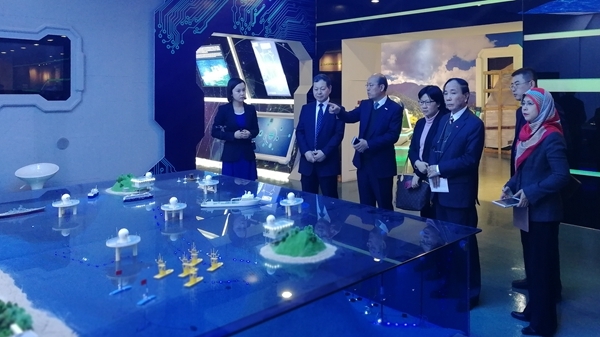 Accompanied by Mr. Song Jianping, Deputy General Manager of CETC International, and Mr. Guo Chuanwei, Trade and Investment Director of ACC, officials from ASEAN embassies visited the exhibition hall of CETC International, which covers around 10,000 square metres. Visitors showed great interest in the R&D capabilities and products with independent intellectual property rights of CETC International in smart cities, new energy, public and cyber security, disaster prevention and early warning, and watched the operation demonstration with great interest. After field visiting, the visitors had a discussion with the senior management of CETC International. On behalf of CETC International, Vice General Manager Song Jianping warmly welcomed the visit of the embassies of ASEAN Member States as well as ACC and hoped to take this opportunity to promote CETC’s products, R&D technology and production capacity to the ASEAN market and share with ASEAN countries the opportunities and achievements brought by China's innovation. On behalf of ACC, Director Guo Chuanwei thanked the embassies of ASEAN Member States in Beijing and CETC International for their support to ACC. He said that ACC is willing to serve as a bridge connecting Chinese and ASEAN enterprises to carry out scientific and technological innovation and mutually beneficial cooperation, so as to generate more achievements in ASEAN-China cooperation on innovation. Senior officials of embassies of ASEAN Member States including Minister Counsellor (Science and Technology) Pasupha Chinvarasopak from the Embassy of Thailand, Minister Counsellor (Commercial) Razida Razak from the Embassy of Malaysia, Counsellor (Economics) Tan Hong Ngoh from the Embassy of Singapore, and Councellor Nguyen Van Chieu from the Embassy of Viet Nam, fully exchanged views with CETC International on the company’s current cooperation with ASEAN countries, its competitive products and technologies, and the prospect of expanding ASEAN market. ACC will continue to pay close attention to ASEAN-China exchanges and cooperation on innovation and help synergize the two sides’ efforts in pursuit of innovation-driven growth to elevate ASEAN-China strategic partnership to a new height.